What you alway wanted to know about Mozart! Honestly, why one more book about Mozart? This is a good question after those years of “worn out Mozart.” It is a question that I had to face. First of all, I had to ask myself if I should actually offer a particular Literary-Trail-Tour with Mozart as its theme. 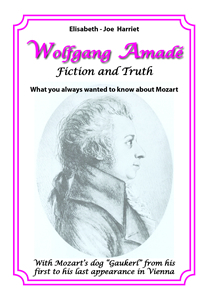 To answer this question I investigated several other information publications and walking tours that covered Mozart. I noticed that nearly all of them presented only very selective details of his life and this was done in a rather uncaring and superficial manner. So I ventured to tackle Wolfgang Amade’s last ten years in Vienna. While researching various sources, I discovered outstanding and fascinating texts as well as I gained new insights. Inspired by the amazement and the enthusiasm displayed by visitors, and their inquiries while moving along this “Wolfgang Amade” literary trail, prompted me to publish a book that parallels the walking tour. Mozart and his father left so many letters and personal notes that we can follow the authentic path from his first to his last appearance in Vienna. This permits the correction of many errors and misinterpretations that have surfaced pertaining to this great musician and composer. Furthermore, I back up my research with the only autobiography of an eyewitness, Franz Xaver Niemetschek, from Prague, published in 1798. I also refer to Friedrich von Schlichtegroll, author of the 1791 “Mozart Nekrology”. The latter was based on a biographic essay of Mozart’s sister “Nannerl”, the personal diaries of Maria Anna Mozart and commentaries of various Mozart contemporaries. On this walking tour you will get to know locations that, many participants admit, are even unknown to most Viennese. Especially noteworthy is that you wind your way, nearly exclusively, through alleys, streets, gateways, backyards and squares that look today nearly the same as they did in Mozart’s time. We actually start at the scene of Mozart’s first appearance in Vienna. But, in consideration of those who may wish to save a few steps, it is not necessary to follow the stations of this literary walk in chronologic order. I thus ask you to use this guide with mental flexibility. How to use this book and what this dog “Gaukerl” is all about, you will find out next. Enjoy Mozart the way he was!